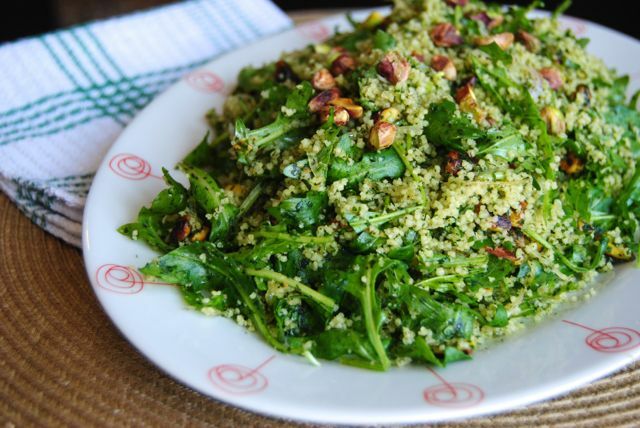 Toasted pistachios, arugula and a fresh herb paste transform simple couscous into a gorgeous green salad that tastes even better than it looks! One thing about living abroad is that you have to be careful not to accumulate too many possessions. I still don’t own a cast-iron skillet, for example, because I don’t really feel like lugging it around with me for the next several years until I settle down in one place. A KitchenAid mixer is also high on my list of things that I want but am not willing to carry, along with many, many, many cookbooks. I love cookbooks but they are just so heavy. One of my favorites at the moment is Plenty by Yotam Ottolenghi. I have three of his cookbooks (well, e-cookbooks) but Plenty is the one that I keep going back to again and again, sometimes to try a recipe but often just to look at the gorgeous pictures. 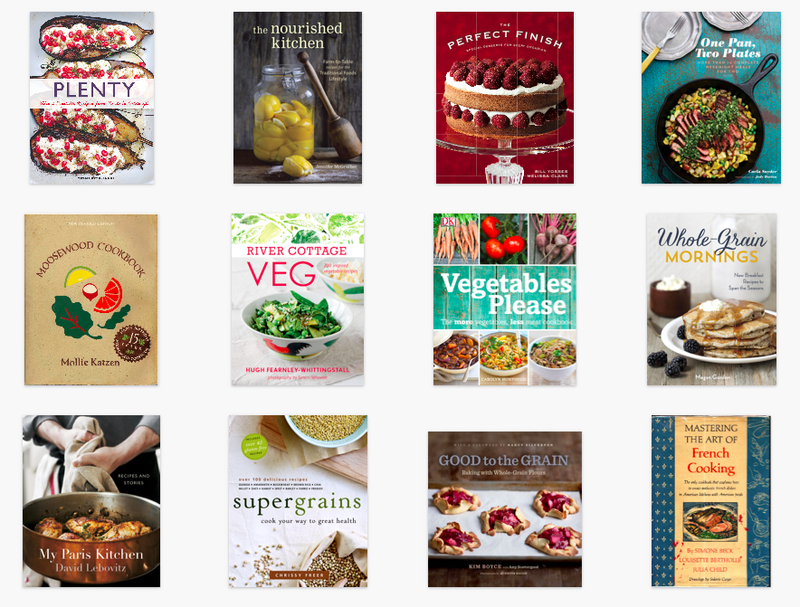 One benefit of an e-cookbook is that I can’t mess up the pictures by drooling all over them. I’ve been meaning to try this recipe for Green Couscous ever since I first saw it in the book, but just finally got around to it. I’m so glad that I did. After the first bite, I made a solemn vow to make Green Couscous again, every day, forever, until the end of time. … perhaps I was being a wee bit dramatic. Still though, this is one that I will surely make again and again. The nutty crunch of the toasted pistachios, the just-barely-noticeable warmth of green chili, perfectly balanced with five different herbs… I can’t do this dish justice with words. Just make it and see for yourself. I think the trick to this couscous is slicing the onion, green onion and chili as finely as possible. These ingredients almost disappear into the couscous, giving each bite a surprising depth of flavor. My boyfriend’s dad asked “What is in this? Where does that flavor come from?” because what looks like a simple salad is actually very rich and flavorful. 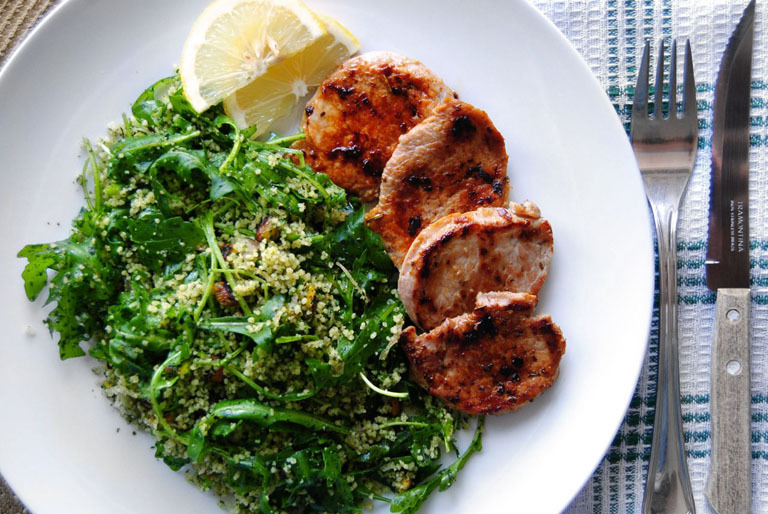 We ate this as a side dish with pan-fried pork tenderloin but I think it would be even better with fish or chicken, as long as the meat is quite simply seasoned. The original recipe also recommends adding feta cheese for a more substantial salad, in which case I think it could easily stand alone as a light vegetarian meal. Bring vegetable broth to a boil. Remove from heat, add couscous, stir and cover. Let sit for 10 minutes, while you prepare the other ingredients. Heat one tablespoon of olive oil over medium heat. Add sliced onion and fry until completely soft and golden brown. Add salt and cumin, mix well and set aside to cool. To make herb paste, combine all the ingredients in a food processor and process until smooth. Add the herb paste to the couscous and stir until evenly combined, using a fork to fluff it up. Add onion, pistachios, green onion, green chile and arugula and stir to combine. Sprinkle with lemon juice and toss once more before serving. Serve at room temperature. When I moved overseas I said goodbye to most of my books and other things except for cookbooks. I only kept the ones I really loved, and all other books I now buy as e-books. But I still by physical cookbooks from time to time if they’re something special! I have Plenty but I haven’t tried this recipe yet. Your words about it are so inspiring I think I’ll have to make it immediately! I have most of the ingredients on hand already, just need to seek out some pistachios and I’m good to go. Thanks for the recipe! Hi Katie! Thanks for your comment. I do have a few cookbooks, mostly that I’ve picked up while traveling. They’re wonderful souvenirs! Do try this salad, because it really is special, and let me know how it goes. Do you have any other favorites from Plenty? I’ve been dying to try the “very full tart”.